My friend Debby@Debby Kratovil Quilts contacted Linda@Buzzing and Bumbling and me with a challenge using Blank Quilting's Madeline collection. We decided to make it a mini blog hop, so make sure you go check out their blogs to see what they created using this fun fabric. 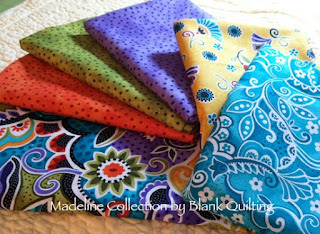 The colors of Madeline just scream summer with the bright colors of purple, orange, teal, green and yellow. Summer around here means weekend trips and day rides on our Goldwing, so the fabric was begging to be made into pouches and bags for me to use on our trips. I don't always like to take my purse with me, but I still need necessities like chap stick, a comb, sunscreen and things along those lines. For the larger items I need to carry with me, I made a drawstring bag using Jeni@In Color Order's tutorial. For the smaller items I used Debbie@A Quilter's Table tutorial she shared of her triple zip pouch. It's the perfect size to hold my packets of drink mixes, chap stick, loose change and it fits all nice and tidy inside the drawstring bag. I love the 3 zip pouch and cute little drawstring bag - this is such a bright and fun line. Thank you for sharing. I really like both of your bags! 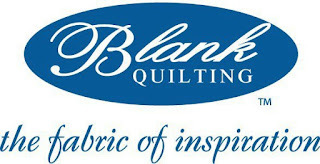 This fabric line is definitely one I will watch for! I love the large print, and the others coordinate so well in terms of proportion and contrast -- and they are BRIGHT! They definitely turned out terrific, and who can't use a colorful new bag or pouch? The drawstring bag is so colorful, love the triple zip pouch. Madeline is indeed a bright, cheerful, summery fabric. I love the drawstring bag. Happy quilting. Very pretty bags - love the new fabric collection. 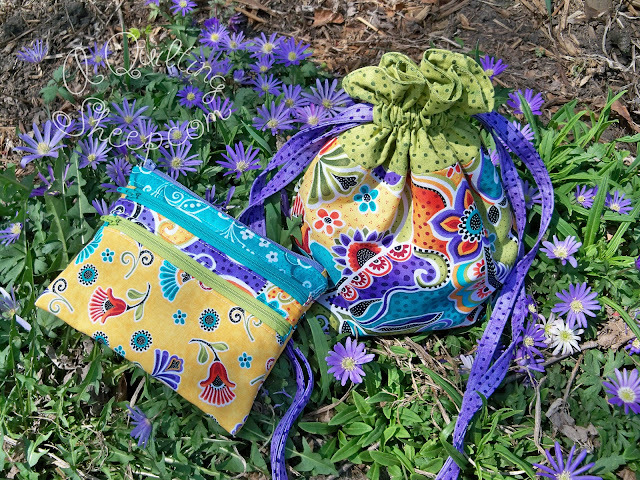 I love that fabric and the bags you made - so colorful and "happy!" And I love your blog; so glad that this mini blog hop lead me to it! I love these! Especially the triple zipper pouch. I've seen that tutorial and been wanting to give it a try. Perhaps I will :) The fabrics are so bright and cheerful. Thanks for sharing! Beautiful fabric and love the zipper pouch. Great idea for those bright fabrics! I love them! I will be looking for them! I did visit your partners! I don't usually go for bags in general but these two are really cute! I would use these! great job! Amy, your bags are just beautiful!! What a great use for this cheerful fabric! BAA! VISITED ALL 3 SITES+BLANKS! YOUR LITTLE ZIP BAG IS ADORABLE! Your bags turned out so cute. Love both of your bags, very handy. Amy. These are so clever but what I love the most is that photograph with those purple flowers. You couldn't have asked for a better backdrop! The bags are super - I admire anyone who does things other than quilts. I guess I'm a one-track hamster on a continuous wheel! Very cute bags, really like the drawstring one. I love the fabrics, they just look so summery. Hi!!! Love your bag and pouch!!! Very pretty fabrics!!!! Amy, what a darling little set. The colors are really cute. Zippers don't care for me. I've yet to be succesfull with one, but yours looks great. I love that pouch! This fabric is very pretty. Thanks for sharing your projects. Isn't this fabric pretty? Great bag and love your 3 zip pouch. I've actually made that pouch and it's so useful. The fabric is so pretty! Your bags look great! Hi. I am visiting from Debby's blog. i love the bags you made. The fabric is so pretty with it's bright colors. i really like the purple that is in there. The fabric is beautiful and I like what you made.